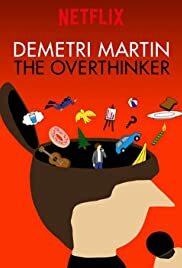 Demetri Martin pitches totally practical and not at all unfeasible promo ideas for his new stand-up comedy special, The Overthinker. Streaming August 10 on Netflix. Demetri Martin and Marc have important things to talk about, mostly involving the hard knocks Demetri took from other comics when he started out and his recent ventures into film and TV. There’s also the matter of having a father who was a priest. Plus, Marc frets over his keynote speech at the Just For Laughs festival.